The 31-year-old was awarded the Alfredo Di Stefano trophy and the latest Pichichi award at a ceremony on Monday. The Barcelona ace has consistently remained at the top of his game since emerging from the club’s famed youth ranks and will now have his eyes fixed on hitting 200 awards before his career is over. A fierce battle for supremacy with Juventus’ Cristiano Ronaldo ensured levels did not dip and with every passing season, the individual honours came rolling in. But it got Sportsmail thinking, just how many does Messi have to his name? Messi’s first individual honours came in 2005 when the diminutive Argentine attacker was just 18. He impressed at the FIFA World Youth Championship in Holland and returned home with the tournament’s Golden Ball (Top goalscorer) and Golden Shoe (Best player). Success in that tournament also saw him gain recognition back in Argentina as he was awarded the first of his 11 Olimpia de Plata trophies – Argentina’s Footballer of the Year. The Golden Ball, awarded to the best young player in Europe, capped off a fine campaign where he firmly announced himself for club and country. Under the tutelage of Frank Rijkaard, Messi soon became a hit at the Nou Camp and in 2006, 2007 and 2008 he collected a further 19 individual honours. The Trofeo EFE, awarded to the Best Latin-American player in La Liga, arrived before he turned 20 and he won World Soccer magazine’s World Player of the Year three years on the spin. His sheer determination to maintain is incredible levels of performance season after season have seen him earn a spot in the FIFA FIFPro World XI for each of the last 11 years. The Ballon d’Or is the award many of the game’s top talents crave the most and Messi has five in his cabinet – an achievement matched by Ronaldo. In fact, no other player since Kaka in 2007 has taken the sought-after award. One of the more remarkable realisations from a breakdown of Messi’s honours is that despite a career where some feel he is the greatest of all time, in La Liga, he has only won Player of the Month on four occasions, two of which came in the last six months. But various other bodies and organisations have frequently recognised his achievements in Spain. 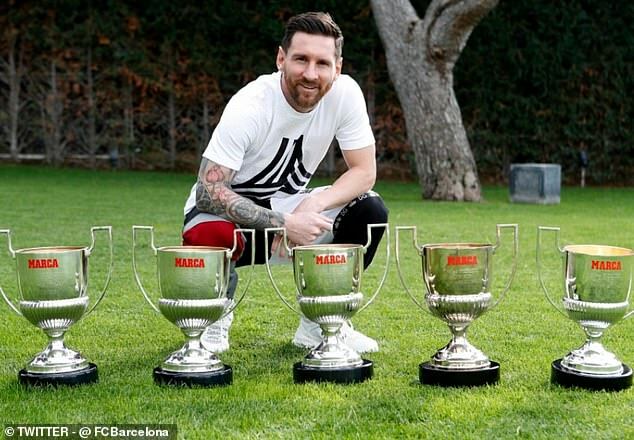 He has won the Trofeo Aldo Rovira, awarded to the best player at Barcelona, six times while he has been deemed La Liga’s Best Player eight times. Messi hit 34 goals in 36 La Liga matches last season and will hope to better that this time round despite his early season set-back with injury. Golden boots are nothing new to him having won five Pichichi Trophies – which goes to the the highest scoring player in the league. The Champions League has also been lit up through the years by Messi and his excellence in the 2011 Wembley final against Manchester United stands out – that night he took home two individual awards, as well as lifting the biggest prize in club football. He was selected as UEFA Man of the Match and also the fans’ Man of the Match having inspired Pep Guardiola’s side to a dominant win over Sir Alex Ferguson’s United.